J-Tap was an eye opening, hands on, training opportunity dealing with the actual nuances of facility activation and transition. 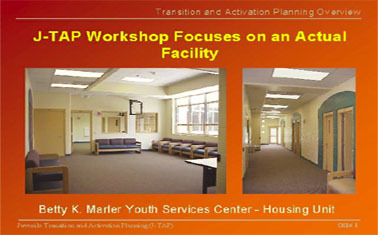 We (OHIO) would recommend this program to anyone embarking on the challenges of opening a new facility. The transition planning process encompasses all of the tasks that must be undertaken prior to the opening of a new facility. These may include developing resident programming, determining staffing needs, training personnel, and preparing scenarios, post orders and policies and procedures. JSG introduces team members to operational, programmatic and organizational concepts and processes that may be used in the transition and activation process to help ensure that the new facility functions as designed and in a manner that meets its mandates and mission. We work closely with jurisdictions to develop or assist in the development of operating procedures and all of the written materials that support those procedures. JSG staff has extensive experience in conducting post-occupancy evaluations of programs and facilities. Using a range of participatory methods such as surveys, participant observations, focus groups, interactive workshops and in-depth interviews, JSG helps the client to identify the weaknesses and strengths in their operations and find ways to improve them.